A man raising money for charity by carrying out an underwater marathon in an old-fashioned diving suit has emerged from the depths of Loch Ness, after completing his challenge. 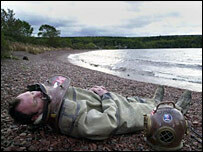 Lloyd Scott has spent the past fortnight negotiating a 26-mile stretch of the murky Highland loch in the 120lb outfit. As he emerged, Mr Scott, 41, from Rainham in Essex, said it had been a hard journey but he was happy it was all over and that it had been worth it. Mr Scott, who has become well known for taking part in more conventional land marathons in London, New York and Edinburgh wearing the same type of suit, put the gear to its intended use for the first time. When he stepped out of the water at Lochend, near Inverness, he said: "I've had to cope with poor visibility, which has at times been nil, I've had to work against the resistance and the pressure of the water. "You don't know what's underfoot - sometimes its mud, silt, rocks or nothing. "The airline also kept getting caught and I also had to deal with a build-up of carbon dioxide in the helmet. It's also very cold and very lonely." 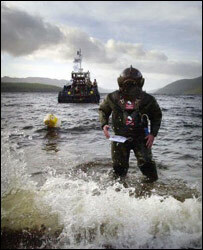 He added: "It's definitely been far more difficult doing it underwater than it has been on land." Mr Scott, a former firefighter and professional footballer, spent more than a month training and qualifying as a diver for the bid, to raise awareness for a major fundraising drive for the charity Children with Leukaemia. Mr Scott, who won a battle against leukaemia himself, began his journey on September 28 at the opposite end of Loch Ness in Fort Augustus. His risky attempt has not all been plain sailing. Last week he injured his shoulder when he fell 15ft off a ledge while in the loch. His diving support team had to rescue him by pulling him up on a safety line. But, as well as raising vital charity cash, his completion of the challenge has set a new world record for the first underwater marathon of Loch Ness. Mr Scott revealed he is already planning his next unusual fundraising stunt - to cycle across Australia on a penny farthing bicycle. "Lloyd Scott said the challenge was unforgiving"